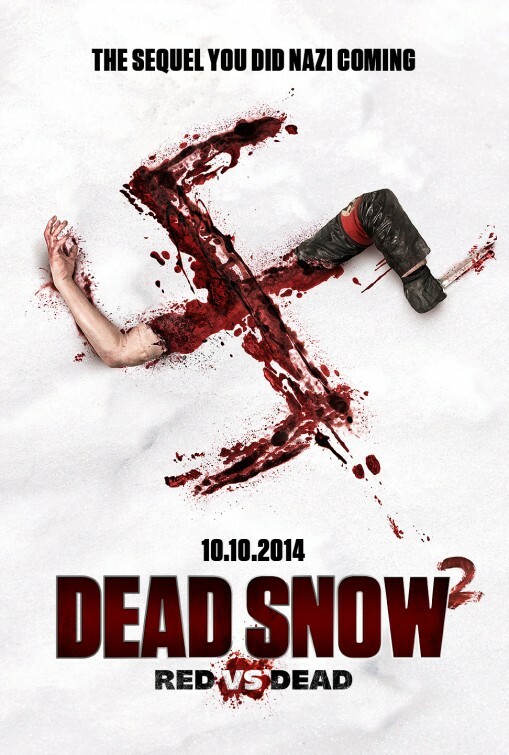 John’s Horror Corner: Dead Snow 2: Red vs Dead (2014; aka Død Snø 2), more innovative use of intestines, more chunky gross head-smashing and more Nazi zombie killing equal more slapstick hilarity. MY CALL: A maniacally slapstick, ultra-gory horror comedy that checks its scares at the door to reach all new levels of hilarious, gross nonsense. MOVIES LIKE Dead Snow: For more Nazi horror, go for Dead Snow (2009), Green Room (2015), Yoga Hosers (2016), Manborg (2011), Hellboy (2004), Zombie Lake (1981), Oasis of the Zombies (1982), Frankenstein’s Army (2013), Puppet Master III: Toulon’s Revenge (1991), Puppet Master: The Legacy (2003), Puppet Master: Axis of Evil (2010), Puppet Master X: Axis Rising (2012) and Puppet Master: Axis Termination (2017). 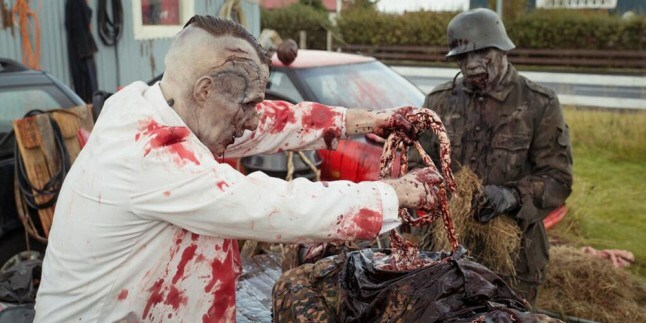 After a Bruce Campbell-inspired chainsaw self-amputation, Dead Snow (2009) ended with the now one-armed medical student Martin (Vegar Hoel; Dead Snow, Kill Buljo 2, Hansel & Gretel: Witch Hunters) getting to his car to escape the worst Easter holiday ever! Following a quick recap of part 1, we pick up exactly where it left off and enjoy all the enthusiastic intestinal shenanigans of its predecessor! The energy is high as we jump right into the deep end of gore with haphazard attempts to give a Nazi zombie mouth-to-mouth rescue breathing, possessed/marionetted murderous rage, blatant guts-strangling and organ-brandishing, bare-handed scalping and chunky head-smashing, general blood-splattering stabbery, some just plain cruel zombie crotch humor, projectile vomit and even vomit-eating! Yuck! It likewise captures the same levels of silliness, in fact drastically more so, and the gore is consistently abundant. Written (in part) and directed by Tommy Wirkola (Dead Snow, Hansel & Gretel: Witch Hunters, Dead Snow 2: Red vs Dead), this sequel gets a tad meta when Martin recruits the help of a group of zombie “believers”: Daniel (Martin Starr; Intruders, This is the End), Monica (Jocelyn DeBoer) and Blake (Ingrid Haas). This sequel feels less like a standard horror comedy and more like a comedy action horror; that is to say, less Evil Dead 2 (1987) and more Army of Darkness (1992). Martin gains use of the head Nazi zombie’s magical arm and uses it to raise a Russian legion (of the dead) of his own. 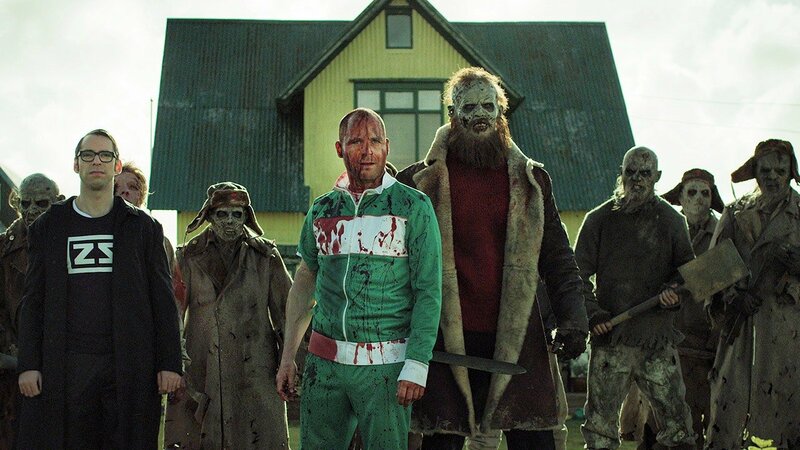 With this, we enjoy zombie versus zombie melee action galore and goofy zombie field medics to draw grins, but almost no moments of nervous urgency as we experienced watching characters getting picked off one by one in Dead Snow. Any notion of dread has been replaced by supercharged slapstick horror violence and maniacal blood-lusted smiles. And whereas this is a pretty entertaining horror comedy which aims high and brings greater scale, it doesn’t quite have the charm of part 1 which felt more dire, spent less time fully immersed in silliness, and enjoyed bright blood red over stark white snow. However, what it retains from part 1 is its blood-caked mania. And for this, I still rank it highly entertaining and rewatchable. MORE HORROR COMEDIES: For more horror comedies try Critters (1986) and sequels, Brain Damage (1988), Blood Diner (1987), Frankenhooker (1990), Bloodsucking Pharaohs in Pittsburgh (1991), Leprechaun (1993) and sequels, Head of the Family (1996), American Psycho (2000), Shaun of the Dead (2004), The Hazing (2004), Black Sheep (2006), Dead Snow (2009), Cabin Fever 2: Spring Fever (2009), Chaw (2009), Piranha 3D (2010), Tucker and Dale vs Evil (2010), Final Destination 5 (2011), Chillerama (2011), Piranha 3DD (2012), Grabbers (2012), The Cabin in the Woods (2012), Bad Milo (2013), Warm Bodies (2013), The Editor (2014), Burying the Ex (2014), The Voices (2014), Smothered (2014), What We Do in the Shadows (2014), Housebound (2014), Zombeavers (2014), The Voices (2014), Cooties (2015), Deathgasm (2015), Bloodsucking Bastards (2015), Scouts Guide to the Zombie Apocalypse (2015), He Never Died (2015), Ava’s Possessions (2015), The Final Girls (2015), Krampus (2015; not exactly comedy, but occasionally hilarious), Love in the Time of Monsters (2015), The Greasy Strangler (2016), Better Watch Out (2016), Mayhem (2017), Happy Death Day (2017) and The Babysitter (2017). ← John’s Horror Corner: Dead Snow (2009; aka Død Snø), an extremely bloody Norwegian movie about Nazi zombies inspired by Peter Jackson and Sam Raimi.